Kitsch and chichi mingle at this tiny, hidden spot in the posh Parker Meridien. It’s a perfectly re-created burger emporium circa 1972, down to the “wood” paneling, vinyl booths and iconic ingredients, such as Heinz ketchup and Arnold’s buns. The burgers are picture-perfect, too—juicy and flavorful with the perfect degree of char. Get “the works,” with tomato, lettuce, pickle, mayo and red onion. The fries are only fair, but milk shakes are thick and good. Hidden little burger bar in the Le Meridian hotel in Midtown. It was hectic inside at peak lunch time, with a combination of tourists dining in and local workers picking up take away. The burgers were really good - nice thick beef patties, cooked medium. The decor adds to the atmosphere, with customers names and messages written all over the walls. If you're willing to wait, its worth the visit. Really cool atmosphere - feels like a hidden treasure, and the decor makes you wonder is this the right place? Built as if it were a burger shack (neon signs and all) what this really means is you will be cramped (as the joint is kind of stashed in the corner), wait for a while, and not be able to find a seat when you're done. The staff (which is mainly line cooks, and a cashier) are friendly, and certainly as well trained as the hotel staff - will make the experience more enjoyable, and ultimately the food speaks for itself. The downside is the price which matches the quality, and makes you remember this isn't a shack this is a fancy hotel. It was cool to go here for the back-room ambiance and they DO make a damn good burger (fries are totally skippable though, there were kind of tasteless and barely warm.) Also heads up, the word is out on this place. Super long line to get in, you could barely move inside too, and this was on an off time. You know this place has turned into a tourist trap due to the fact that there are menus in every language outside in the hallway on the way in. They're also super nice to you at the counter and take cards now, which also used to be things of the past. If you're nearby though and want to check it out, do! Love this "hidden" gem! 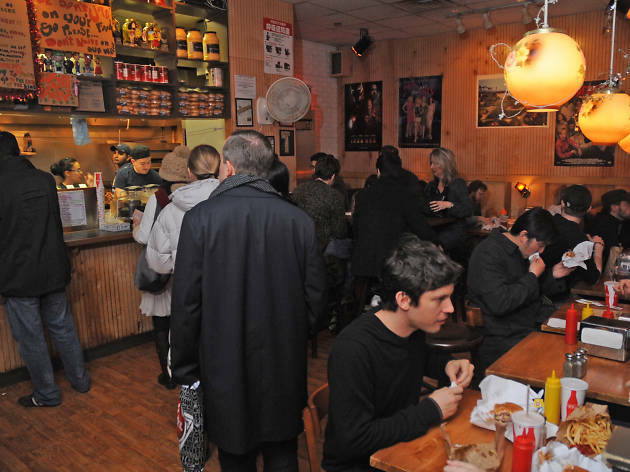 I discovered Burger Joint a few years back when some coworkers and I wanted to try something new and a bit different for lunch in the heart of Midtown. This place didn't disappoint. It has a bit of a speakeasy feel since there is no signage for it in the lobby of the posh hotel. 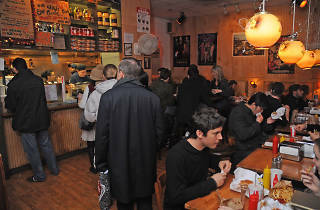 The room where Burger Joint is located is decorated with cult classic movie posters on wood paneling that is fit for your mom's basement, but it has charm. The burgers and fries are simple, but like Shake Shack and other popular casual burger establishments, it's all you'll need. Be courteous and don't hang around too long after finishing your meal if you're there during peak lunch hours during the work week - the room is small and the line tends to wrap well out into the lobby.